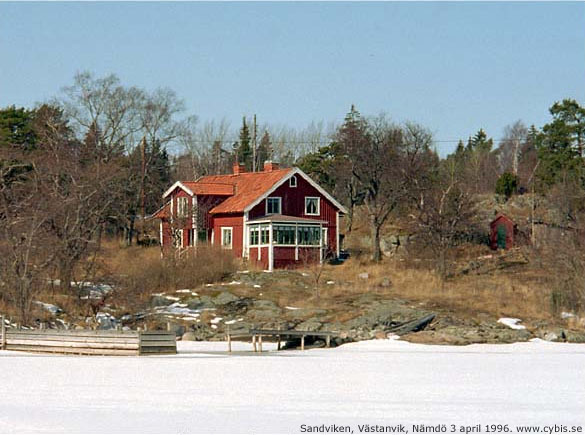 This is the Sandviken house at the Västanvik homestead on the island of Nämdö in the Stockholm archipelago. The photo is taken from the sea ice a sunny day in the early spring of 1996. The old part of the house is a timbered cottage which was enlarged to the current appearance around 1890. Among people living in the 1990th, little was known about the house. Somebody thought it had always been standing here as a part of an old croft. Local story-tellers said that the parson lived in the house before or after the time when the Russians burnt down the whole archipelago in 1719. It was also told that the parson's house and the church was not actually burnt down. So, can this be a house built before 1719? A map from 1865 originating from the partition of the manorial estate Östanvik at Nämdö showed no houses at all here. But there has always been a question if the house was excluded from the map because it was privately owned and did not part in the partition. 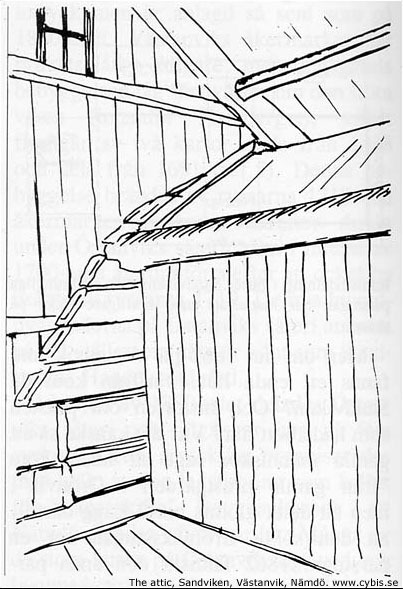 In the attic we can see the adjacent room in the old mansard superstructure as a separate building inside the house. Our dendrochronological analysis revealed timber logged in 1748, 1769, 1867 and 1893.
the major part of the house was built by loggs from 1769, possibly as the main building at the nearby Grönvik croft where there is an old school house today. in 1867 the house was moved to its current place at Västanvik when it probably got its mansard roof. logs from 1748 are replacements of decayed logs inserted when the house was re-erected at Västanvik. The 1748 loggs probably come from the old mansion at Östanvik which was built around 1750 and was dismounted around 1865 and distributed among the heirs. the house was enlarged in 1893 probably with the intension to let the house to summer visitors, the new way at that time to get some ready money. This takes down a lot of local historical speculations to more of reality. A more detailed article about the house and the dating is available as a .pdf-file in Swedish.